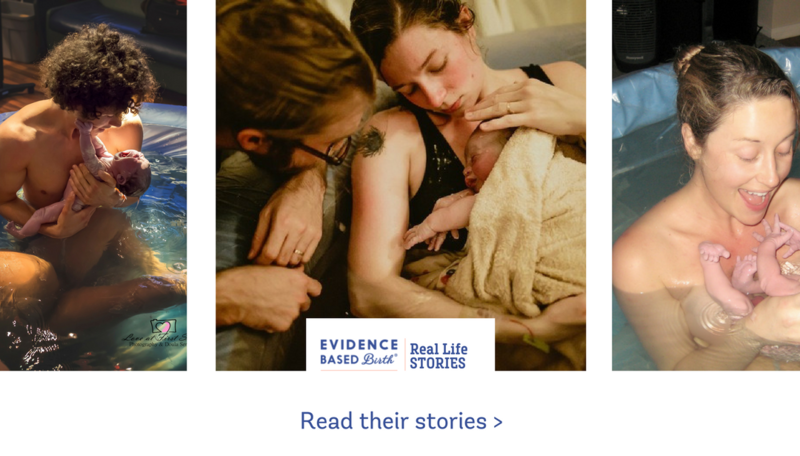 Below are real life stories submitted by people around the world for our recently published Article – Evidence on: Waterbirth. I’m a recently-graduated RN (and was trained as a CPM before that—now about to go for a masters in Public Health Nursing and Midwifery, to be a CNM). Thank you so much for your work in the nursing world, as an educator, and for your dedication to reviewing and disseminating information about the evidence, both to the general public and to professionals. I am humbled by your productivity. I refer my colleagues and expecting parents to your site often. Here’s a photo taken a couple of minutes after my son’s birth last October. He is our first child. He was born after an uncomplicated pregnancy at 39+6, at my parents’ house in New Jersey. (Baltimore, where I live, is unfortunately not a good area in which to have a birth center or home birth, because CNM practice is heavily restricted and transport options are dismal, despite our prestigious medical facilities). I had about 3 hours of active labor, and our average-sized baby arrived with a compound hand on the right side of his head. 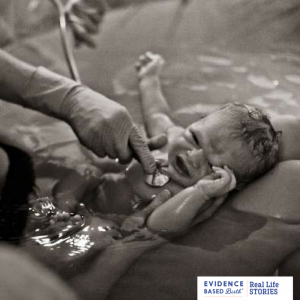 His birth was attended by a CNM, an RN, and a doula. I received a dose of PCN at my midwives’ office, about 2 hours before active labor started, when my water broke (GBS+), and another dose just before he was born. This was one of the many reasons I was grateful to have access to CNMs. They have an excellent transport situation, because they have admitting privileges at a baby-friendly hospital—I was really lucky that their practice is near my parents’ home. For the record, I would prefer to have access to a high quality birth center with nitrous oxide, in closer proximity to a hospital—but this was the best we could do. I should also let you know that I had missed some important information from and criticisms about the Cochrane review you examined in your GBS article—so thank you for making a difference in my ability to knowledgeably consent to antibiotic prophylaxis. If you decide to use the photo, I can send a full-resolution image (I didn’t want to send a giant file unless you think it will be useful). Also, I have good-quality photos of labor, and of his actual birth, if you end up short on those for your article. My second baby was born at home in water. It was a precipitous labor of only an hour and 45 minutes and labor was probably triple the intensity of my first baby. Thankfully it was short. The water was a godsend. It was the only thing that gave me any relief from the intensity. We barely got the tub filled up enough for me to birth in it. My Augusta was born only a few minutes after I got in the tub and was born en caul! It was an amazing experience. 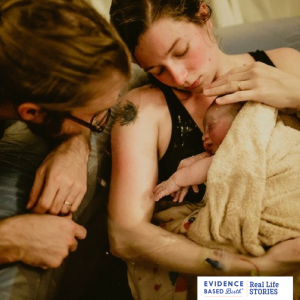 After having my first baby unmedicated in the hospital, I knew I wanted to have a home birth with my second. I hired a wonderful midwife, and included waterbirth in my plan though I was open to the fact that I may not want to be there when the time comes. After 30 hours of my membranes releasing, surges finally began and I laid in bed for about 3 hours before I needed to get up and walk around. 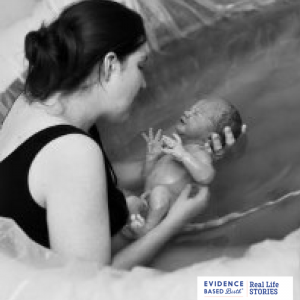 We started filling the tub, and my midwives and photographer came over. As soon as there was enough water in the tub I got in, the warm water providing immediate relief. I found I was most comfortable laying over the side, holding onto my husband, and allowing my lower body to simply float behind me during surges. 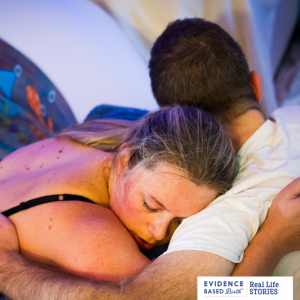 A few hours later, my body began to nudge my baby down and during those surges I’d get my knees under me to feel more grounded as I breathed my baby down. In between I went back to floating and releasing any tension. Only 7 hrs from my first surge my little redhead was born into my midwife’s assistant hands as I awkwardly turned around to receive him onto my chest! It was night and day compared to the hospital. I am SO happy I chose this for my second baby’s birth – the water was everything I’d hoped it would be! 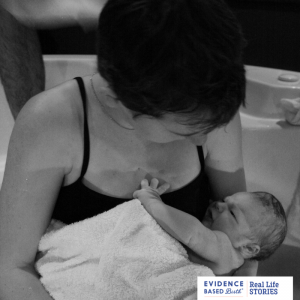 I was interested in a waterbirth, and labored in the water with my first baby, but I didn’t want to be in the tub anymore after my water broke at 9.5cm. For my second baby I really wanted to try for a waterbirth again. I almost gave birth on the toilet! I labored in the hospital tub for a couple hours, got out for a walk and some monitoring and vital signs, and my water broke while I was sitting on the bed. I went to get back in the tub, and decided to use the bathroom before getting in. While I was still sitting, I started feeling nauseated, so I asked for a vomit bag. However, a few moments later, I felt a contraction building, and I could tell that what I was feeling was not nausea, but my baby moving down, and fast! I pushed past my midwife, husband, and doula, jumped back into the tub, got down on my hands and knees, and my baby’s head was born! One involuntary monster push later, and she was born! My midwife, despite being right beside me, only had time to put on one glove to catch, but she kept beautifully calm, coached me through staying low enough in the tub that my baby was born completely underwater to avoid the breathing reflex before lifting her out of the water, passed my baby gently to my arms, and I announced, shocked, to the room that we had a daughter. Despite her precipitous delivery, I loved my waterbirth experience, and delivered my third baby in the water as well. Our firstborn was birthed in the hospital in a semi-reclined position and I sustained significant tearing which has had long term repercussions for me. 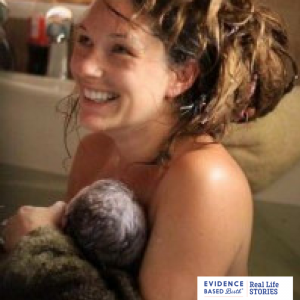 I knew for this next baby I wanted a completely different experience and after reviewing the evidence I was able to find, I decided I wanted to try a waterbirth, at home if possible. Our midwife and doula were very supportive and we rented a birth pool shortly thereafter. I birthed our second son in that birth pool on my knees, reached down and pulled him to my chest and we enjoyed the most peaceful transition I could’ve imagined. I felt empowered and in control and supported in my autonomy. 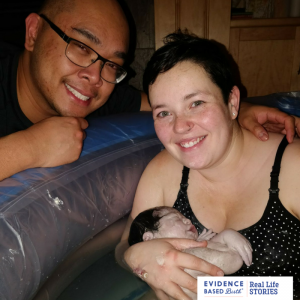 My husband, who was anxious about the idea of waterbirth, says he now wouldn’t hesitate to recommend it to anyone who is curious. I didn’t experience any tearing at all this time and I attribute this to the deep level of relaxation I experienced in the pool, and having had the opportunity to birth in a safe supportive environment. If I am ever blessed with the opportunity to birth another baby into this world, it’ll be in water. I went into labor early on my due date with Emrys, my second baby, and arrived at the birth center around noon. My son was in a posterior position, and would be born that way – note the caput atop his head, that went down in a few hours. Being in the tub for labor helped me handle the back labor and move around to help him come down through my pelvis. By birthing in the water I was able to get into a deep squat to push (for around 45 minutes) that I wouldn’t have been able to sustain outside the tub. He was born three hours after we arrived, 8 pounds, 11 ounces. I’m a mom of 4, 2 of which were planned Home water births. My oldest sons (now 15 and 11) were hospital births. Neither were what I was expecting or what I had “planned” for. So when my husband and I were expecting our 3rd baby, I decided I wanted to go with a Home water birth. From the moment I went into active labour, all I wanted to do was get in the tub, but I didn’t. I walked and I went up and down the stairs as much as possible. And then transition happened. 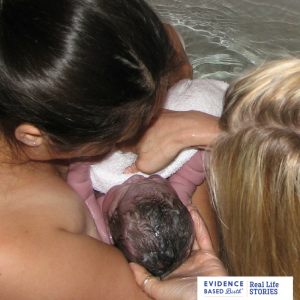 I thought she was coming right then and there….and my dreams of a water birth were fading. Just then, my midwife said to me that if I wanted a water birth I should get in now. The tub filled slowly, but I got in right away. Once the water hit my body, it’s like the pain dissipated. I was able to rest comfortably in between contractions which now felt much more manageable. Why wasn’t I in the tub hours ago? The urge to push came naturally, which I allowed my body to take over. I felt no “ring of fire”, no tearing and the “pushing” stage lasted less than 10 minutea. When she came into the water, I was able to bring her up to my chest, wrap her in a towel, and hear her cry for the very first time. Her birth was really everything I could have ever wished for….perfect. My labor began around 10pm on Thursday November 30th, with mild but painful contractions. My mother is a midwife & i planned on having a water birth at home so I didn’t need a “go bag” or anything like that, I was ready to meet my baby girl, even if she was still a few weeks early. My dad woke up and prepared the birth pool, while my partner and I danced around the house trying to find a way to ease my pain. Walking, squatting, up and down the stairs, talking, crying, you know..the many ways of getting through contractions. I was In and out of the pool quite a few times, Sophea’s Heart rate was extremely elevated due to my exhaustion and dehydration. Around 8:30am, my mom told me to get out of the water as it was time for an IV and she wanted to check my dilation. I was 9 cm! She decided to break my water to see if that would get things moving. About 2 minutes after she broke my water I knew I had to get back in the pool RIGHT away, baby was coming! I launched Myself into the pool, and my body started pushing before I could even submerge myself in the water! After only about 9 minutes, her head popped out into my hands. With one more large exhale she came flying out right into my arms. I caught her all by myself surrounded my the love of my home. It was phenomenal. Water without a doubt was a huge pain relieving technique, both the immersion in a tub and the use if the shower, which played a big role during my labor too. My birth experience led me to teach prenatal yoga and become a birth doula. My second birth took place in a birthing center attached to a hospital. There was a big tub to labor in but policy meant the actual birth was ‘not allowed’ to take place in water. I was told if you did, then baby would have to be taken to NICU to be checked out (eye roll) I worried about this after the experience with my first birth but it turned out I actually needed to birth in a different way in order for my midwife to assist me to my benefit, this birth was trickier for me. However laboring in water saved me from intervention when I had to labor through an hour 1/2 of push contractions. Resisting the urge to bear down in order for a swollen cervical lip to reduce before I could birth my baby. This was by far the most challenging hour or so of my life! The only way I could resist the overwhelming urge to bear down was to labor through the contraction immersed in water, that and chanting/singing/some kind of warbling noise to bring the energy up and out and not down, my husband recorded some very interesting audio!!! 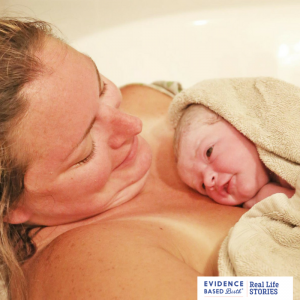 When Josey and her husband got pregnant with their second child, they decided to meet with a local homebirth midwife who had 25+ years experience delivering babies – many of them into water. No local hospitals currently allowed waterbirth. At 40w4d, Josey birthed her son into the water after a quick, 4 hour labor at home. At 9 lbs 5 oz, he was over a pound bigger than his older sister, but Josey says, “Thanks to the water and the assistance of the midwife, it was a much easier, more joyful birthing experience. Photo credit: Debra Hawkins at www.joyousmomentsphoto.com. Dawn is a nurse at the birth center where she had a waterbirth with her second daughter, She is also a student at Frontier Nursing University studying to be a midwife. Dawn says, “This is my 8 lb 10 oz posterior girl whom I pushed out in 19 mins. The back labor was terribly hard and I’m pretty sure I would’ve thrown in the towel and asked for a transfer if not for the water! !